I set confirmationMessage for simpleAction1. I want the the confirmationMessage show,How to set? In order to fix the issue, we must first reproduce the issue in our labs. We are unable to reproduce the issue with the steps you provided using the Xafari Demo, shipped with XAF. 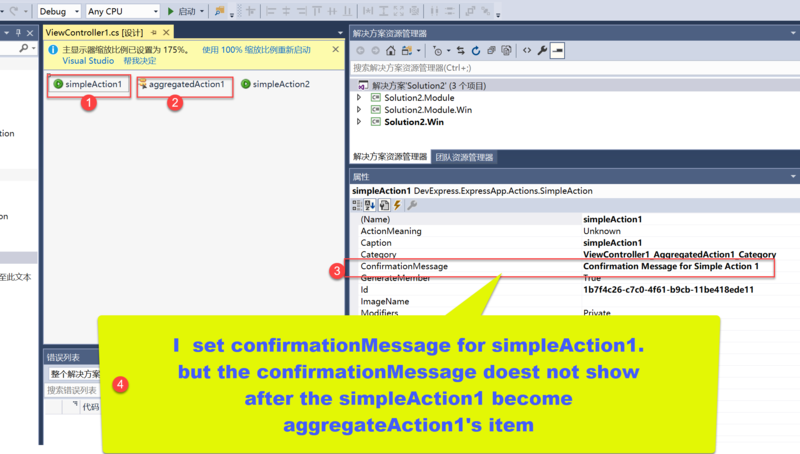 In this project, I set comfirmationMessage for simpleAction1, simpleAction2 and simpleAction3. simpleAction1 and simpleAction2 is sub item of aggregatedAction1. The confirmationMessage dialog does not show for simpleAction1 and simpleAction2. simpleAction3’s comfirmationMessage dialog work fine. Thanks for the provided information, nickcole. We are going to investigate it. Give me some time. Set WinApplication.UseOldTemplates to true so that comfirmationMessage show. Is there a way to use the new templates? To use new templates, you need to add a custom control for the aggregated action. How to configure and add a new control, see the attached files.